In 1990s Muncie Lakes Pathway was a battlefield over trail use conflicts, with equestrians and mountain bikers and Nordic skiers and snowmobilers waging war. Today the 9.8-mile trail system is one of the most popular in the Grand Traverse County, thanks to its proximity to trail-crazy Traverse City and the hard work of the Michigan DNR and user groups to educate their members and separate their trails. 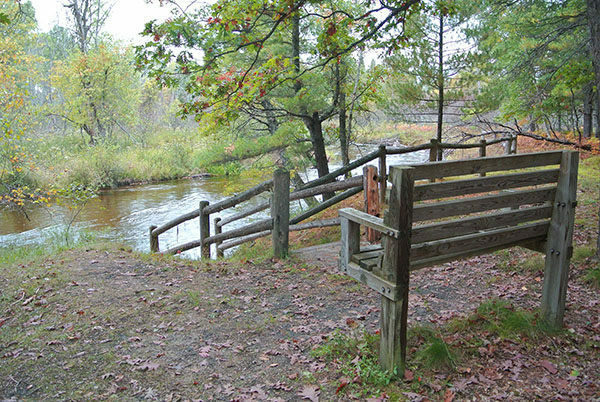 The area, a slice of the Pere Marquette State Forest that includes the scenic Muncie Lakes and the Boardman River Valley, is still covered with trails, including the North Country Trail, the Shore-to-Shore Horse Trail and Snowmobile Trail No. 5. Add gas and power line corridors and handful of old two tracks and you have a hardwood forest that is crisscrossed with paths and rutted dirt roads. But an emphasis on marking the various trails, particularly the pathway, keeps you on the right route and gets you back to your car before dark. In the winter Muncie Lakes is groomed with single track for classic skiing; in the summer mountain bikers are the predominate users of the pathway. 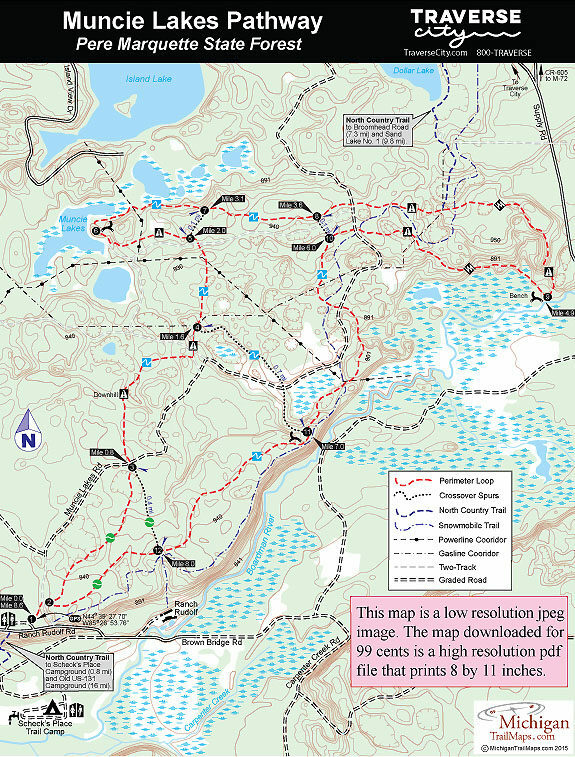 Muncie Lakes is primarily an 8.6-mile loop, the route that is described here, with four crossover spurs. Splitting it in half is Muncie Lake Road, a graded dirt road that mountain bikers and hikers can also utilize to shorten their outing. From the seat of a mountain bike much of the pathway is a beautiful single-track of rolling terrain through a mixture of hardwoods, pines and upland meadows. 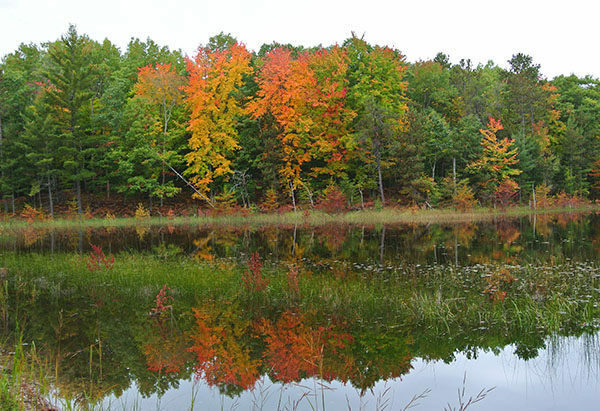 It can be a scenic ride, especially in October, as the trail winds past small lakes, follows ridges with views of the Boardman River Valley and descends to the trout stream itself, the same river that eventually makes its way through downtown Traverse City and into Grand Traverse Bay. The pathway is not technically challenging but cyclists do have to keep an eye out for numerous stretches of loose sand. 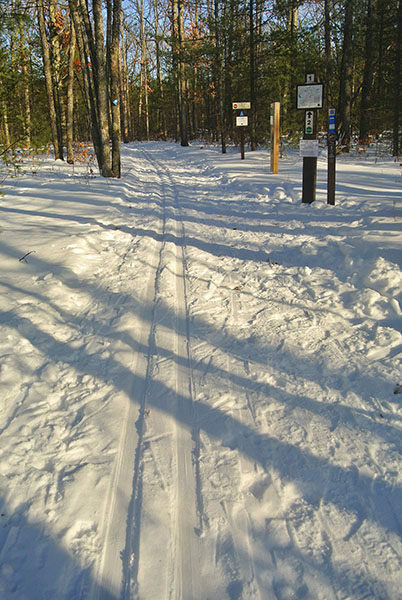 Cross country skiers will discover mostly easy to intermediate trails that includes numerous hills beyond post No. 3 but few that are death-defying with sharp grades or sudden change of directions. The exception is the back loop, from post No. 8 to No. 9 to No. 10, which features three long downhills and is rated most difficult. There is no designated direction of travel on the pathway but most skiers follow it in a clockwise direction, the same direction the numbered posts are laid out. The first loop is the easiest and the only one rated for beginner skiers. From the trailhead to post No. 3 and then to No. 12 before returning is 2-mile run through hardwood forests and past open meadows. At post No. 3 the perimeter loop continues north (left), crossing Muncie Lake Road into more rolling terrain. You encounter three downhill runs with the final that bottoming out at post No. 4 at Mile 1.6 , marking the junction with the second crossover spur. Head left to immediately cross a gas line corridor followed by another climb and long downhill to post No. 5. Head left again to pass underneath a power line corridor and enjoy a pair of downhills before reaching the Muncie Lakes at Mile 2.4. 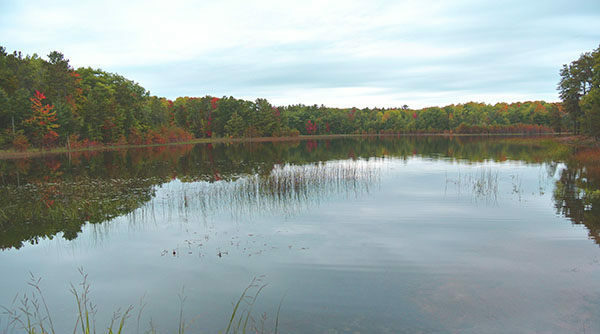 The scenic and undeveloped lake before you is the largest of five often referred to as Muncie Lakes. The trail skirts the shoreline and then climbs to post No. 6 where a skier’s bench has been built, making it an excellent hot chocolate break in the winter or an energy bar stop in the summer. Beyond the post is a long downhill that bottoms out at the second Muncie Lake before crossing back under the power line. You skirt the third lake before a long climb takes you back into the woods on a scenic stretch to post No. 7, reached at Mile 3.1 and marking the short crossover to post No. 5. It's an easy half-mile through the woods to post No. 8, the junction of the final crossover spur, the one that allows you to bypass the black diamond loop to the Boardman River. The 1.3-mile segment between Posts No. 8 and No. 9 is the gem of the system. The trail crosses Muncie Lakes Road again and a snowmobile trail and then plunges down into a deep little valley. At the bottom is the gas line corridor where the North Country Trail departs the pathway and heads north for the Sand Lakes Quiet Area. The perimeter loop continues east, crossing the snowmobile trail again and then giving way to a wicked downhill. A ridgeline follows, one so narrow you can peer into the woods on both sides of you, and then a final downhill leads you to the Boardman River. On the banks of the river are post No. 9, reached at Mile 4.9, and a bench where you can catch your breath after all that exhilaration. The return begins with a boardwalk around a wetland and then a half mile climb out of the Boardman River Valley. A downhill follows in an area that can be confusing as you will be crossing gas line corridors, other trails and Muncie Lake Road before arriving at post No. 10 at Mile 6. Head south (left) and in the next mile the trail will cross gas and power line corridors, Muncie Lake Road again, Snowmobile Trail No. 5 twice and lord knows what else. Keep an eye out for the blue blazes that mark the pathway from on this stretch and all the way back to post No. 2. After crossing the snowmobile trail a second time, you skirt an interesting wetland full of standing dead trees, no doubt the work of a beaver, then make a long climb to cross the Shore-to-Shore Trail and arrive at post No. 11 at Mile 7. Nearby is a bench to enjoy view of the river valley below. The pathway to post No. 12 remains in a rolling wooded area where it is intermingled with the Shore-to-Shore Trail, crossing it five times. You reach post No. 12, at Mile 8, marking the first crossover spur, and a side trail to Ranch Rudolf. You cross the horse trail two more times before reaching post No. 2, where you backtrack the first segment of the day to the trailhead. The Muncie Lakes Pathway trailhead features a large parking area, a vault toilet and an information kiosk. On the south side of the parking lot the North Country Trail is posted and from there descends the bluff on its way to Scheck’s Place State Forest Campground, reached in less than a mile. A Recreation Passport for state parks is required to use Muncie Lakes Pathway. There is also a donation pipe to pay for grooming the trail in the winter for skiing. Please give. From M-72, turn south on County Road 605 (Williamsburg Road) and follow it for 6 miles until it merges with Supply Road. Continue south on Supply Road until it crosses the Boardman River and then turn west (right) on Brown Bridge Road. Within 2 miles, the road crosses the Boardman again, passes the entrance of Ranch Rudolf and comes to a V-junction. Head right on Ranch Rudolf Road up the steep hill to the posted trailhead on the north side of the road. Contact the Traverse City DNR Field Office (231-922-5280). For travel information contact Traverse City Tourism (800-872-8377; www.traversecity.com).